rec. live, Sanders Theatre, Harvard University, 4 December 1962 (Mahler 1) and 13 November 1962 (Till Eulenspiegels lustige Streiche). Symphony Hall, Boston, 12 November 1963 (Mahler 5). Respected for his Mahler interpretations, Erich Leinsdorf (1912-1983) was known both for his work in opera as well as his convincing performances of orchestral music. Leindorf’s esteemed recording of the composer’s First Symphony is best encountered through a sound recording, currently available on Red Seal CD 63469A, a two-disc set that includes Leinsdorf’s recording of Mahler’s Third Symphony. Even though the sound on this DVD is mono, the result is quite effective. More than that, the release gives a vivid image of Leinsdorf at the podium, which also reminds modern audiences of his regular television broadcasts with the Boston Symphony Orchestra on the station WGBH. 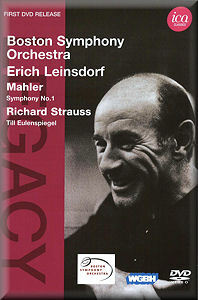 In fact the performances are from 4 December 1962 (Mahler: Symphony no. 1), 13 November 1962 (Strauss: Till Eulenspiegels lustige Streiche), and 12 November 1963 (Mahler: Symphony No. 5: Adagietto only). The images recall television in its first decades as it brought the arts from its point of origin to the world. Camera angles are good for the day, with the close range reflecting more the limitations of technology than the creativity at the core of broadcasts like this. Yet the sound stands out in this recording, as Leinsdorf moves from the somewhat wooden gestures at the opening of the first movement to the lively manner with which he handles the first theme. When the introduction reprises, Leinsdorf appears warmer, as he leads an inspired performance of this now familiar work conducted entirely from memory. In this video it is possible to see how Leinsdorf offers a supple approach to tempo, which offers appropriately spacious phrasing throughout. His cues give a sense of the style that he wanted from the players, and the result is evident in the performance. While Leinsdorf’s manner at the start were somewhat overstated, when the orchestra is at the full tutti of the recapitulation, he held back on his movements as the players reached the climactic point. He captures the style of the second movement from the outset, in an extrovert performance of the Scherzo that benefits from the single gesture per measure. Part of the success of the interpretation comes from Leinsdorf’s decision not to use the baton, and so his hands offer a clue to the ways in which he made this performance expressive. The third movement is particularly effective for the woodwind sonorities in the passages that evoke the “Bohemian” musicians to which Mahler referred in some of his own descriptions of the piece. If Leinsdorf was at times minimal in his gestures, it had an excellent result in the allowing the performers to arrive at a tight-knit ensemble. The Finale has the conductor in outstanding form, as his mastery of the score emerges in a completely convincing reading. Never overindulgent, his conception is present in almost every expression Leinsdorf used in this compelling reading of the Finale and, ultimately of the entire piece. As a live broadcast, the performance of Mahler’s First Symphony has some imperfections, but the strength of the interpretation and strong response of the Boston Symphony overweigh them. With the video, too, the superimposed image of the conductor over the orchestra, a technical feat of the day, has its place in the period when this was recorded. The occasional bump that jerks the camera is a good reminder of the spontaneity involved in this broadcast. Most of all, the quality of the performance stands out. Leinsdorf’s command of Strauss’s famous Till Eulengspiegel is equally fine, with the subtleties from the podium contributing to the irony of the tone poem. The performance is strong on clarity of detail and tight ensemble. At the same time, the “bonus” track offers Leinsdorf’s impassioned reading of the Adagietto from Mahler’s Fifth Symphony. It has all the ‘earmarks’ of a romantic reading, with fine details, such as portamento, brought out expressively. It is good to have Mahler’s First Symphony and the other two performances from Leinsdorf’s maturity available now on DVD.